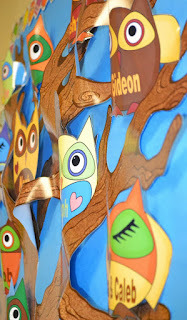 I actually was looking for a new owl bulletin board set from Carson Dellosa, and they have several choices, but none of my local teacher supply stores had any of them in stock! So, I used the owl graphics I have from www.ScrappinDoodles.com and made my own! 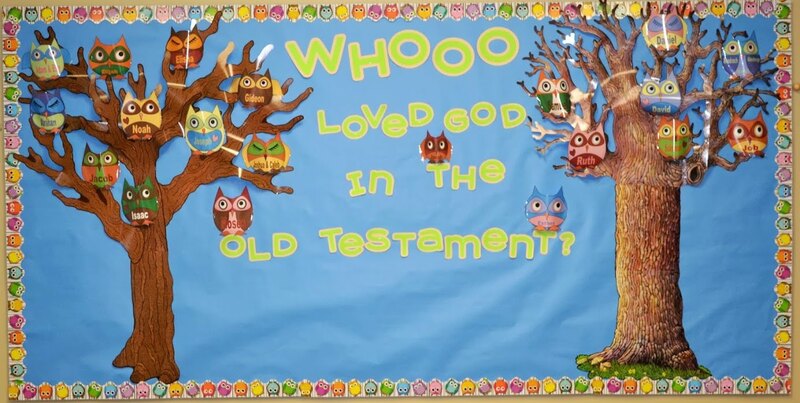 There are 20 owls with the names of the people from the Old Testament that my class will be studying until next June, so I plan to leave this board up until then and I can just switch add-ons like leaves, snow, etc. for the next couple of seasons. 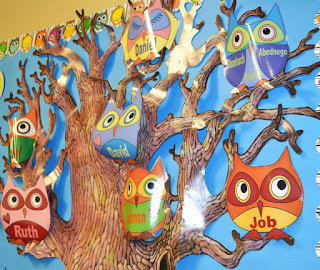 (Once I had the board up, I liked it without anything else and wanted to keep the focus on the owls.) Unless I get bored or think of another bulletin board to share and I need the space! These owls in the above photos show you how I added pop to make the tree limbs and owls have shape. 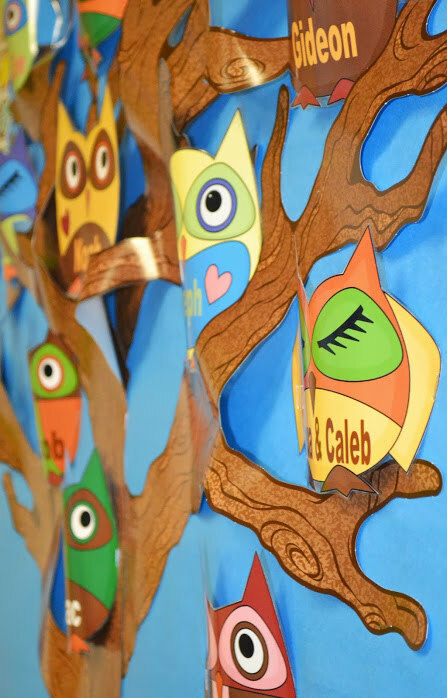 I stapled one side of the owls to the board, then held the other side slightly rounded out, not flat against the board, to make them stick out. 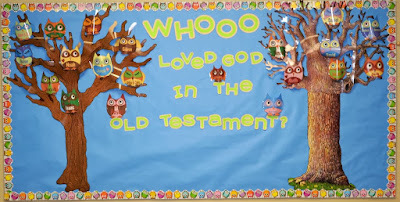 I did the same with the tree limbs and stapled the limbs down without making them flat against the bulletin board. All the owls are in the download and there is a list of the order I used. You can print them here. This is sooooooo cute! Thank you for sharing. I teach this same content in my sixth grade Religion class. I won't use these materials this year as I have everything planned out, but I know what I'm doing next year. THANK YOU!!!!!!!! Thanks for the super nice comment! I appreciate you visiting! I really love everything you post. Thank you for sharing. 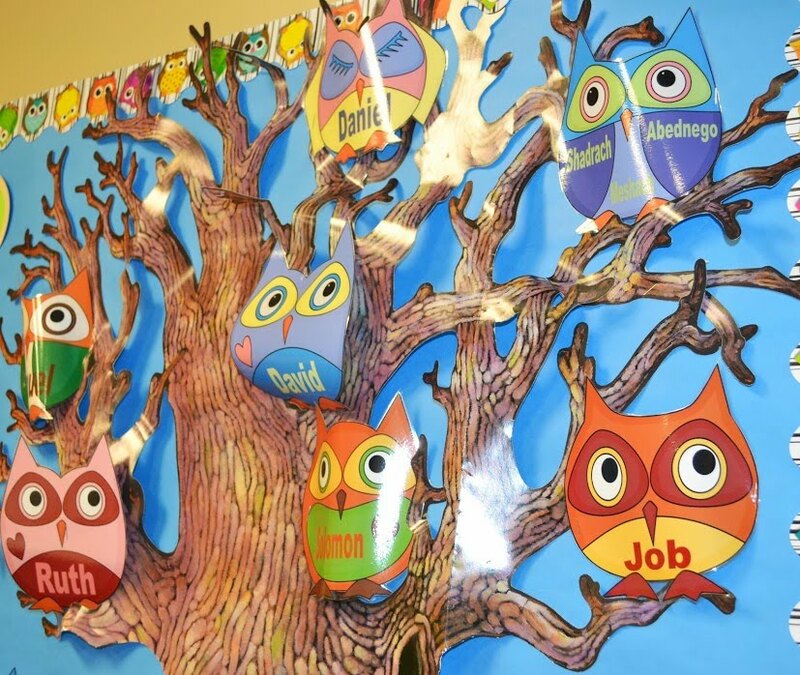 I am using OWLS in my Sunday School class this year. Kindergarten. Thanks so much for the nice comment! I appreciate it! I am so excited to print these out. Now, I just have to make the tree. So happy you can use them! I thought about making the tree... then I just used what I already had! Thanks for the comment!